No Excuses For Denying Your Creative Juices! I am hope all is well and looking to share exciting creative opportunity to support Hebrew HealthCare. The cartoon editor of The New Yorker magazine is our featured speaker at our big event. Bob has shared an un-captioned cartoon to help us in our mission to support Dementia Care Services. The featured speaker for the Hebrew HealthCare’s 2016 Celebrate Life event is Bob Mankoff, Cartoon Editor of The New Yorker magazine and author of the New York Times bestselling book, How About Never, Is Never Good For You? Mr. Mankoff has graciously agreed to share one of his original un-captioned cartoons for a one-of-a kind ‘Celebrate Life Cartoon Caption Contest’. Please share this unique opportunity with your employees, employers, friends, family and neighbors. 1. 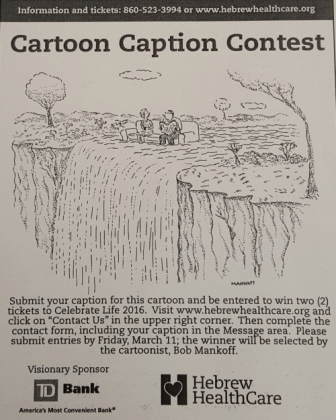 The winning cartoon caption will be personally selected by Bob Mankoff, announced at the Celebrate Life event, and have the opportunity to meet and greet Mr. Mankoff at his Private Reception. 2. Caption contest winner will receive two free tickets to the Celebrate Life event. This event will be held on April 17, 2016 at the Bushnell Center for Performing Arts. ( A $500.00 value). 3. The deadline for submission is midnight Friday, March 18, 2016. Employees can simply visit here to enter their clever captions. Please note the ‘Mankoff Original’ cartoon attached to this email. Thank you for your support and it is my hope that you and others will be tickled to actively participate in our event’s community engagement efforts. Should you have any questions, please contact me anytime. P.s. If you are interested in advertising your business in our Celebrate Life Digital Tribute Book, please let me know, the deadline for the ads are Friday, March 11, 2016.